Reliable mail service is critical to the success of any organization. We provide a professional presence for your business as well as a safe, secure, consistent and reliable place to receive deliveries. Our staff are on site during regular business hours and accept packages and mail from the US Post Office, FedEx, UPS, DHL, and local couriers. 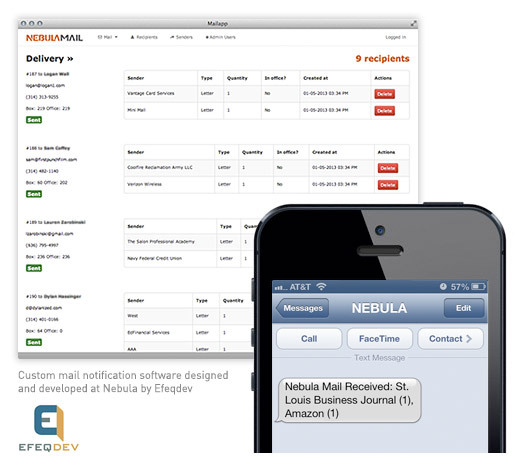 All mail services at Nebula include free notification via email or text message using custom software designed and developed in conjunction with Nebula-based developers Giant Hat. We’ll let you know when your mail arrives as well as who it’s from and whether it’s a package or letter. Having a private mailbox gives you additional privacy by not having to give out your home or work address. Your information is safe in the hands of our trusted and trained staff. Mail or packages are never opened without a specific written request from the receiver. All mailboxes are secured with their own dedicated lock. Our mailbox lobby is well lit and monitored with security cameras. Access to the building is limited by keycard access to members only.